The Bronx River Parkway (BRP) is a major north-south transportation artery in southern Westchester County. The BRP is on the National Highway System and the northernmost portions, including the project area, are on the National Register of Historic Places. Approximately midway on this route in Westchester are two interconnected bridges that cross the Bronx River and the MTA Metro-North Railroad. 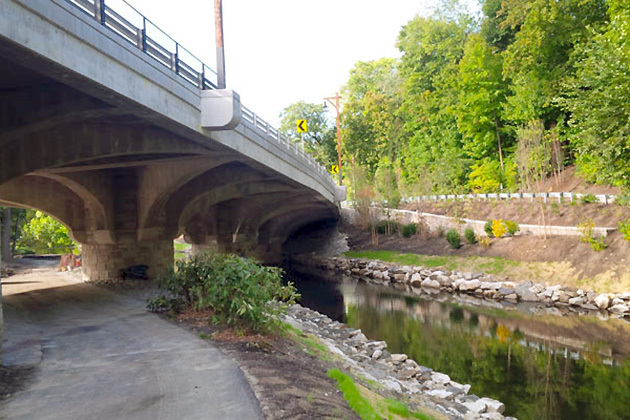 Located immediately south of Exit 12 (Crane Road) in Scarsdale, and straddling the Greenburgh/Scarsdale municipal border, the two connected bridges are referred to as a single structure known as the Crane Road Bridge (or Viaduct). A bridge replacement project is currently underway. To see the progress we've made in replacing the bridge, browse our photo gallery. Built in 1924, the Crane Road Bridge was designed by one of New York’s premier architectural firms, Delano & Aldrich, who designed many historic structures, including the Marine Air Terminal at LaGuardia Airport and Kykuit, the Rockefeller family estate in Sleepy Hollow, NY. The bridge’s circular concrete piers, covered with rustic stone, are reminiscent of a clutch of mushrooms supporting a bridge deck curving gently around Scarsdale Lake, over the Bronx River and the adjacent Metro-North railroad, and through the Bronx River Parkway Reservation. The connected bridges have deteriorated and require rehabilitation or replacement. If you have any questions or comments, submit them online. We have created a list of frequently asked questions for your reference. You may also subscribe to receive updates on the progess of the bridge's repairs. On the afternoon of Friday, September 4, prior to Labor Day weekend, the Bronx River Parkway was restored to full operational in the vicinity of the Crane Road Bridge. The mainline roadway was restored to two lanes in each direction and the entrance ramp from Pipeline/Aqueduct Road to the SB Bronx River Parkway was also reopened. In addition, both northbound and southbound Exit 12 Ramps to Crane Road were reopened. 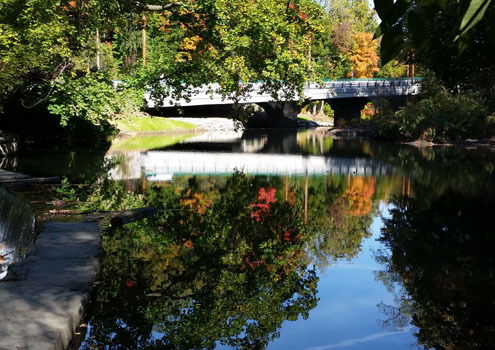 As of October 21, 2015 the Parkland restoration/tree plantings have been substantially completed and the Bronx River Parkway Reservation Pathway reopened to the public. This includes the new sidewalk on the bridge over the Metro-North Railroad and the ramp that accesses the Pathway and the southbound (inbound) railroad platform. Thank you for your consideration and understanding as we have worked towards a successful completion of this project. Read the latest updates about road closures. The project commenced construction in June 2012 and is expected to be substantially completed in August 2015. In accordance with, Article 2 of the New York Eminent Domain Procedure Law ("EDPL"), a public hearing was held on December 6, 2010, for the proposed public project (PIN 8110.13) to reconstruct the Bronx River Parkway at Crane Road within the Village of Scarsdale, Westchester County, New York. Below are the Exhibits from this public hearing, any comments received and the County's responses.